I seem to be all about the bananas lately. 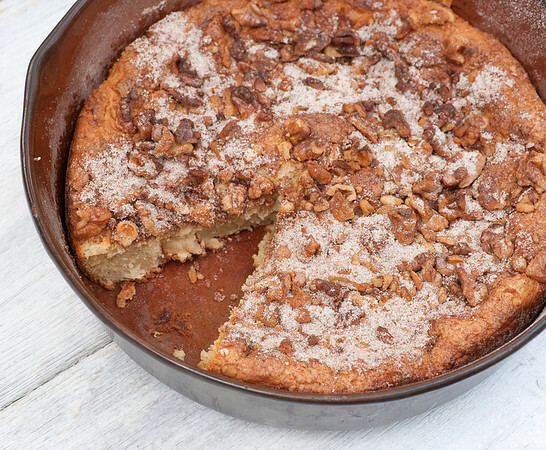 Banana pancakes, banana cake and now this warm and wonderful cross between a banana coffee cake and banana bread, which cooks up in a skillet for extra coziness. There’s something about things cooked in skillets that has me at hello. From spaghetti and meatballs to whole chickens to buttered corn, if it cooks up in a skillet, I’m in. 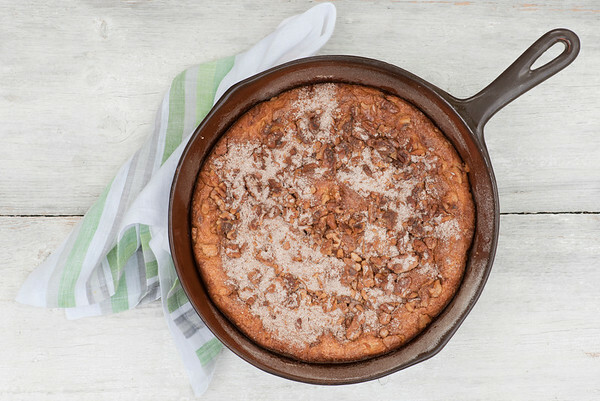 So go find your best oven-proof skillet and let’s make banana bread! A word about my skillet. It’s a somewhat battered old guy, and I have no idea what brand it is. It feels like it wants to be a Le Crueset, but it has no identifying marks so I can’t vouch for that at all. It’s a kind of unfortunate burnt orange color, and I literally have no memory of where I got it…that’s how long I’ve had it. All that being said, it’s my go-to skillet for whenever I need a skillet that can stand up to deep frying or being put in the oven or any other similar kind of skillet heavy lifting. It’s definitely heavy, I’ll say that. And that’s the kind of skillet you want for this recipe…one that is sturdy and reliable and oven-safe. 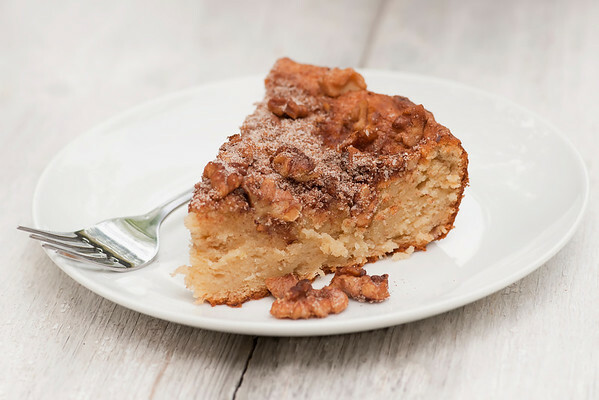 The batter for this scrumptious banana concoction is a mixture of cream cheese and butter, brown sugar and eggs, flour and sour cream and vanilla and a few other things, all topped with a mixture of cinnamon sugar and walnuts. And bananas! All of this gets mixed together, spooned into your friendly skillet, and popped in the oven until it is nice and golden and your kitchen smells like cinnamon and bananas and heaven. And of course, you serve it right from the skillet. Warm. I’m telling you…skillets are magical. Magical! Preheat oven to 350. Coat a 10 inch oven-proof skillet with cooking spray. Beat butter and cream cheese together in a mixer until well combined. Add brown sugar and then eggs, one by one. Mix bananas, sour cream and vanilla together, and then add to the butter mixture. Mix to blend. Whisk flour, baking powder and baking soda together, and then add to banana mixture, mixing slowly unti just combined. Mix walnuts, sugar and cinnamon together. Transfer banana mixture to skillet. Smooth the top and sprinkle with the walnut mixture. Bake until golden, 35-45 minutes or until a toothpick inserted in the middle comes out clean. Cool for about 15 minutes and then serve warm – right out of the skillet! goodness that came out of this skillet. Will give this a try…looks great! Last night I made cornbread in my mom’s cast iron skillet. It is at least 60 years old. I was thinking about all of the fried chicken, cornbread, chicken fried steak and so much other goodness that came from this skillet:-). This looks great and will give it a go! Kate, this recipe looks great, but do you have a suggestion for a substitute fruit for the bananas? I have a household that isn’t crazy about bananas. p.s. : re: skillet memories… my mom made the best roasts in a cast iron skillet… the only way I know to get good dark brown gravy. Yes! My mama has that same skillet. Memories…. I am making this today. It is snowing/raining/foggy and dreary and depressing. Only large amounts of sugar, chocolate and bananas will make me feel better. And THIS is why I am putting a cast-iron skillet on my registry!! Registry????? Do you have something to tell me???? Could that skillet be a Copco? I believe they were around before Le Creuset started importing to the US, and they had that “unfortunate orange” color. And heavy! I bought a set that had teak handles, long teak handles. Even the smallest one was almost too heavy to wield one handed. ;) That said, i have a couple newer, lighter, oven-save skillets, without teak handles, that will work just dandy for this banana bread. Now all i need are some bananas! I will have to do some Google research and see! Do you think this would work with my Calphalon hard-anodized aluminum (NOT non-stick) skillet? The handle is just metal so it’s oven proof. I think that would be fine. My old mysterious skillet is definitely NOT non-stick either.